The Bernhardt Winery tasting room, vineyard, and production facility is located on 20 acres of rolling hills and valleys in Plantersville, Texas, just short drive north of Houston. 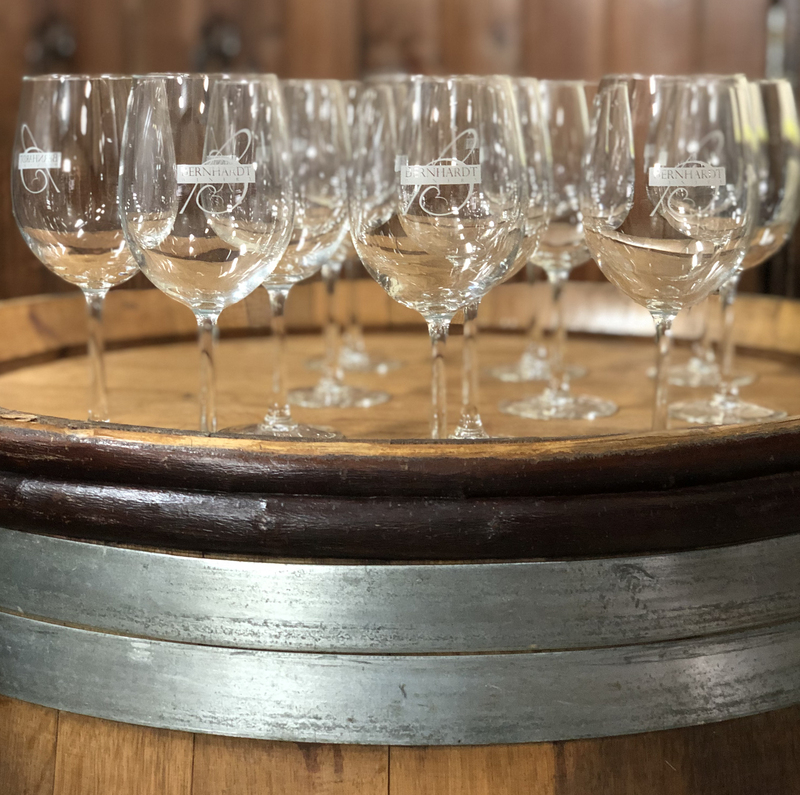 Enjoy a flight at our tasting counter or wine barrels, or choose a more intimate experience by reserving the winery area or the entire building. Listed below are prices of our general tasting events. Call us and we will be happy to work with you to create your own special experience. This includes a tasting of 6 wines available at the time of your visit. The tasting takes place in the Tuscan style tasting room and includes an explanation of our wines and a brief history. Regular tastings are on a walk-in basis and conducted Tuesday through Friday from Noon to 5 pm, Saturday from Noon to 6 pm and Sunday from 1 to 6 pm and later on concert days. Tastings begin every quarter hour and last about 45 minutes. Reservations are not required. Groups of 6 or more are asked to give a courtesy call prior to arrival. Introducing gourmet artisan cheese platters available to order in the Tasting Room every Saturday and Sunday. Pair one with our award-winning Texas wine! Reservations for a private tasting can be prearranged based on availability during our tasting room hours. This intimate wine tasting is conducted in a secluded area in the winery or outside patio areas. Enjoy a tasting of 6 of the wines available at the time of your visit. The tasting includes a presentation of our wines and a tour of the winery and an explanation of the wine-making equipment and process. It generally takes about an hour. Enhance your tasting experience with an artisan cheese and charcuterie platter. Minimum 10 people. A private tasting and glass of wine includes everything listed above in the private tasting, followed by a glass of wine once the tasting is concluded. Minimum 10 people. A dessert tasting includes everything listed above in the private tasting, and also includes an exquisite seasonal dessert paired with our award-winning Port! Minimum 10 people. Add a signature cheese and charcuterie board to your private tasting! Reservations for a private luncheon and tour can be prearranged based on availability. Spend a wonderful afternoon with your group enjoying a light lunch at our Tuscany style winery. As host, you get to select the menu consisting of three entrees and a dessert. We offer a choice of sandwiches, salads and soups in addition to an exquisite seasonal dessert. Add a wine tasting to your lunch event along with pairing our award-winning Port with dessert for an additional $6.00 per person. Minimum 15 people. See menu selections. Spend an enchanted evening with your family, friends or work associates dining in our tasting room or the winery. Minimum 10 people. We welcome the opportunity to host your special private wine tasting experience! Contact us today for availability and reservations.